Recent research published in a paper in TECHNOLOGY reported a novel design of a scale-up nanoporous membrane centrifuge (see Figure 1 (a), (b), (c), and (d)) proposed for reverse osmosis desalination, with proof of concept demonstrated through large scale molecular dynamics simulations. Nanomaterial-based separation membrane technology has been hailed as the game-changer in desalination technology, however, there are two major obstacles to prevent it in real applications: (1) the scale-up challenge, i.e. how to make a macroscale desalination machine with nano-porous membrane, and (2) the fouling problem, i.e. how to prevent Na+ and Cl- ions blocking the nanoscale size pore without consuming much energy. 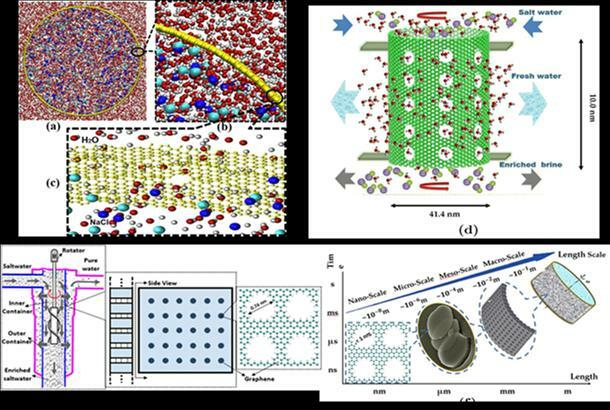 In this work, a team of researchers, mainly consisting of graduate and undergraduate students from the University of California-Berkeley, have constructed an ingenuous design of a scaled-up desalination centrifuge (see Figure 1) that is decorated with nanoscale porous membrane. The nanoscale porous membrane patches are part of the multiscale pore structure on the centrifuge wall (see Figure 1 (e) and (f)), so that it can be readily fabricated for industrial scale desalination operation. Moreover, in this work, we have conducted a large scale molecular dynamics simulation to demonstrate the molecular mechanism of the desalination process, providing the proof of concept of the novel design. The molecular dynamics simulation has convincingly demonstrated that the centrifugal force can balance the osmosis force and provide the thrust of water filtering through nanoscale pores. Furthermore, by using treating the rotating fluid in the centrifuge as the Couette flow, the critical angular velocity of the centrifuge is derived in the first time for such class of desalination machines or centrifuge. The molecular dynamics simulation results substantiated the critical angular velocity derived from the continuum scale fluid mechanics.